The Regional Institute on the Study and Practice of Strategic Nonviolent Action in the Americas offers practitioners and academics alike a great opportunity to learn about, and reflect on, ways to achieve social change nonviolently. Join us to learn how strategic nonviolent action can shift the existing balance of power and increase awareness of issues of injustice with the goal of bringing about change. Come and learn from case studies throughout Latin America and the world. This course is designed to equip activists, scholars, teachers, professionals, and other future peacebuilders from all countries in the Americas with practical tools, knowledge, and hands-on experience to understand the power of nonviolent action to transform the state and society and improve social justice. June 2015, Guatemala City. Findings of the post-war anti-impunity international council triggered mass mobilization against government corruption and impunity. Photo courtesy of Tomas Ayuso. Strategic nonviolent action is a powerful way for people to fight for their rights, freedom, justice, and self-determination without resorting to violence. It can be carried out through tactics such as strikes, boycotts, mass protests and various forms of non-cooperation. As large numbers participate in these actions in a unified, organized, and disciplined way, they disrupt the capacity of their opponents to control events. When a movement sequences its tactics to strategically escalate pressure on its opponent, while remaining resilient and avoiding or withstanding repression, it can impose dramatic costs and force change by undercutting the existing system’s base of support, shifting the loyalties of its defenders and causing bystanders to side with the movement. Many nonviolent action campaigns and movements have created these dynamics and changed history as a result. Even violent adversaries have been susceptible to nonviolent challenges. 97% of participants recommended the Regional Institute to other people. 100% of participants reported that they learned about strategic nonviolent action from other course participants, highlighting the significance of collective horizontal learning that took place at the Institute. The program on nonviolent civil strategies was very nourishing, both for its content and for forming a space of connection among peers, a space to meet, get to know each other, connect, and start working together. Attending the Regional Institute was an incredibly enriching experience both on the intellectual and practical levels. The experiences, passion, and humanity of the facilitators and participants moved me every moment of the institute and give me the strength to continue fighting for a just and equitable world. The institute enriched our knowledge about the importance of nonviolent actions. The experiences of nonviolent movements and campaigns in Latin America that were shared allowed us to reflect on the needs and challenges that we face, and how we can adapt or replicate these initiatives, methods, models and dynamics in order to achieve our goals. I have participated in two very good online courses about civil resistance, and I can say that nothing compares to the experience of learning in real life, building community with other participants and facilitators. From the academic point of view, the institute was absolutely excellent; from the personal point of view, it was unforgettable. The human quality, the openness to dialogue and the richness of the experiences that all of the facilitators and participants contributed, made this institute one of the most nourishing and enriching experiences that I have ever had. There are a limited number of partial and complete Scholarships available, especially for activists in grassroots organizations that do not have any institutional financial support available. The International Center on Nonviolent Conflict (ICNC) focuses on how nonviolent action movements struggle effectively and succeed. They develop and share knowledge and educational resources related to civil resistance with interested recipients throughout the world. 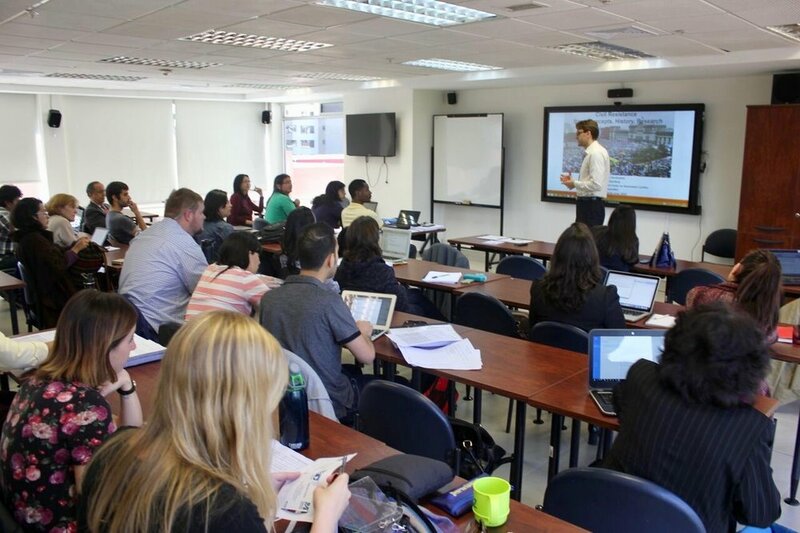 FLACSO Ecuador builds and disseminates knowledge in the field of social sciences and humanities through teaching along with critical and creative research. They strive to contribute to the development of the diverse currents of Latin American and Andean thought, and to promote justice, equity, and social inclusion. CEMPROC aims to reduce destructive conflict and promote global peace, with a special interest in education and prevention. Dr. Maciej Bartkowski from ICNC teaching from case studies. Mary King from ICNC helping a work group in a course on nonviolent action. Chenoweth, E. & Schock, K. (2015). Do contemporaneous armed challenges affect the outcomes of mass nonviolent campaigns? Mobilization: An International Quarterly 20(4), 427-451. Garrido, M. B., Mouly, C., Idler, A. (2016). Jiu-jitsu en contexto de conflicto armado: el poder de la resistencia no violenta. Ciudad paz-ando, 9(2), 155-167. Mouly, C., Garrido, M. B., Idler, A. (2016). How Nonviolent Resistance Works; Factors for Successful Peacebuilding in Samaniego, Colombia. Political Violence @ a Glance. Schock, K. (2013). The practice and study of civil resistance. Journal of Peace Research. 277-290. Stephan, M. J., Chenoweth, E. Why Civil Resistance Works The Strategic Logic of Nonviolent Conflict. International Security 33:1. 7-44.